I recently spent a very cold but very sunny Saturday visiting some beautiful stationery shops in London with Priya from The London Parchment. Our priority for the day was visiting Present and Correct which I have wanted to visit for a very long time. I wanted to share some thoughts on the shops we visited and also share the items I bought. Stop 1: Present and Correct. Present and Correct is located on a small side street in Angel and is kind of hidden away. The shop name is very subtle shown only on the window and easily missed. We jostled for space among other visitors and spent quite a long time closely looking through the contents of the shop and deliberating (not so much Priya) about what to buy. I really liked the presentation of everything in Present and Correct. There were low table tops with the stationery placed in an aesthetically pleasing manner. Shelves also showed off some of the smaller items, notebooks and envelops. Washi tapes were displayed on long hooks by colour. 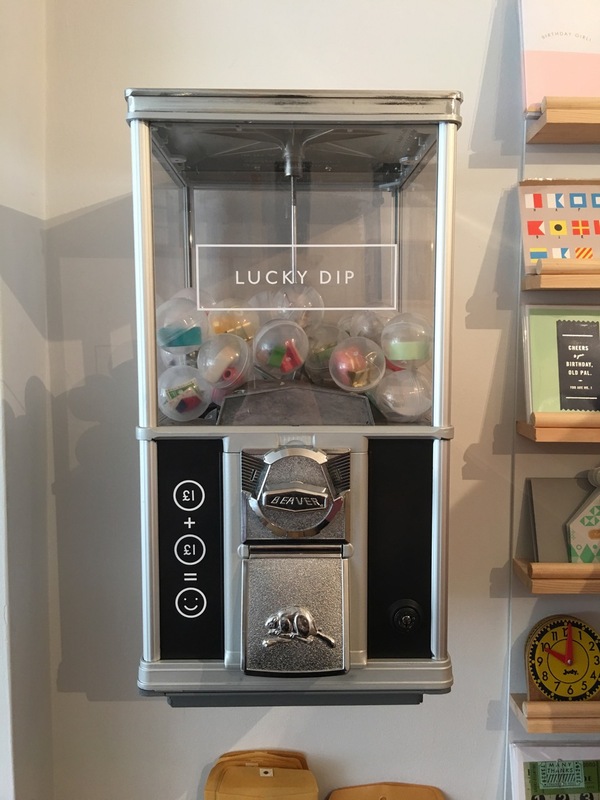 There was an old style vending machine with small stationery items such as clips, erasers and sharpeners. It's such a good use of an old fashioned vending machine. I came away with a few items. One pair of gold Hay scissors, light yellow washi tape that reminded me of Spring, a composition notebook and a pack of 32mm Tools to Live By binder clips. I had been wanting some new scissors and the binder clips for some time. 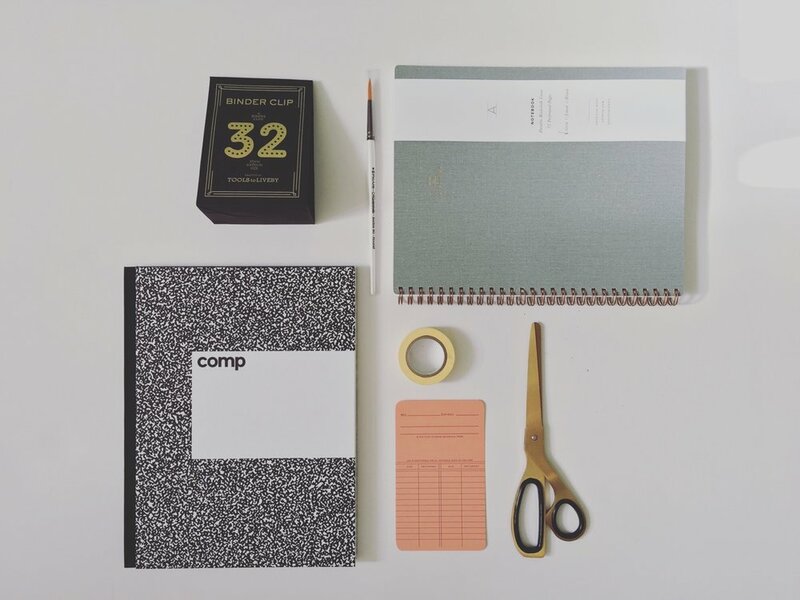 The composition notebook was not what I had expected, I remember this being a Kickstarter campaign but I never backed it. It's pretty pricey at £20 but the paper inside felt really nice in the flesh and I think probably works well with a lot of different writing tools. I also liked the slightly larger than A5 size. I'm really looking forward to playing around with this notebook. The second stop was at Quill. Quill is a completely different to Present and Correct, Priya described it well as workshop space with a number of stationery things too. I really loved Quill. There were so many nice little things focused around the art of writing and calligraphy. They had a great selection of correspondence papers and envelopes some which could be bought in packs of 10, others which were more of a mix and match situation. The colours and styles were all lovely. Unfortunately I didn't get any pictures, I was far too distracted. I came away with an Appointed notebook with the grey cover and a graph ruling. This notebook looked a lot like the insides of the Mnemosyne notebook and I really wanted to test out this paper. Again it's a little larger than the traditional A5 and could be a really good notebook for being creative and playing around with ink and fountain pens. I also bought a round series 60 ProArte Masterstoke paintbrush. Quill recommend this for brush lettering but I think its handy to just have another paintbrush around. Present and Correct was really nice with an interesting range of products. The layout of the shop made it easy to browse and look around with a nice mix of the standard items, such as Kaweco fountain pens and the more unusual such as the Classiky wooden storage boxes and vintage items. Quill was lovely and I really liked the range of items they had in there. They are all linked in some way to lettering and calligraphy from wax seals, paper, ink and writing paper. Quill is more aligned to the way I am using my stationery items at the moment.